Presenter: Jonathon Blissenbach, Director of Product Management for Atomic Learning, Inc.
- What students need to be successful and employable in the workforce. Myths... (these items do not make up what "21st century skills" are. Using Web 2.0 tools = a "21st century teacher"
21st Century Skills are beyond the technology, but understanding why and how to use the technology tools to create relevance for learning. 21st Century Skills: Whya re they important? An excellent example is from the Cyber Summit on 21st Century Skills from Intel. How do I get started? A model for professional development for teachers. All of these attributed to impacting students. Understanding Training Gaps - What are the needs? What are the concepts that teachers are missing? Needs assessment should trigger a teachers understanding and perception for what 21st century concepts are. Develop Skills - Once gaps are identified, come up with a plan. Analyze Progress - Questions to think about - How will progress be monitored? How can you assess that these skills are being developed and applied? Tech Training and "How-to" Support - What kinds of things will you put in place to build capacity or maintaint support? Impact Students - how are you going to leverage your content with the technology? 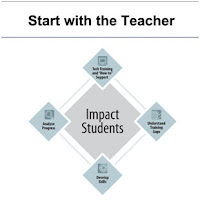 Based on your training, you need to think about how you are making the correlation to student impact. Last, a video was shared about how 21st Century Skills: How do we get there? Basically this was a sales video for Atomic Learning and the products and services they offer. However, they have defined 21st Century Skills as we have seen presented by Mark Prensky. When thinking about 21st century skills, but looking specifically at the teacher we have to assess if these skills set are activitate. If not, then we need to trigger how to reactivate those areas to model for students. As he stated in his presentation, they key element would be how we analyze the progress.